George H.W. Bush (CVN-77) was laid down on 19 May 2003 at Newport News, Va., by Northrop Grumman Shipbuilding; launched on 9 October 2006; sponsored by Mrs. Dorothy W.B. Koch, daughter of President Bush; and commissioned on 10 January 2009 at Norfolk, Va., Capt. Kevin E. O’Flaherty in command. George H.W. Bush, with Carrier Air Wing (CVW) 8 embarked, made her maiden deployment during a voyage to the Mediterranean, Red Sea, Indian Ocean, Arabian Sea, and Arabian Gulf (15 May-10 December 2001). Rear Adm. Nora W. Tyson, Commander Carrier Strike Group 2, broke her flag in George H.W. Bush. The carrier sailed in company with guided missile cruisers Anzio (CG-68) and Gettysburg (CG-64), and guided missile destroyers Mitscher (DDG-57) and Truxtun (DDG-103). She accomplished maritime security operations and supported theater security cooperation efforts. The ship tested the carrier suitability of a Bell Boeing MV-22B Osprey of Marine Operational Test and Evaluation Squadron (VMX) 22 for Ospreys to carry out COD flights, and a Sikorsky MH-53E Sea Dragon of Helicopter Mine Countermeasures Squadron (HM) 14 for mine sweeping, while off the Virginia capes in late January 2012. George H.W. Bush launched a Northrop Grumman X-47B Unmanned Combat Air System-Demonstration (UCAS-D), designated No. 502, while steaming in the Atlantic on the morning of 14 May 2013. On 17 May, 502 performed touch-and-go landings on board the ship. The demonstrator flew from Naval Air Station Patuxent River, Md., and landed on board George H.W. Bush on 10 July. The drone made a second successful landing, but (apparently) diverted to Wallops Island Flight Facility, Va., during a third attempt, and suffered technical problems that also compelled the planners to cancel a fourth landing. These actions marked the first time that a UCAS-D accomplished these operations with a carrier at sea. George H.W. Bush sailed in company with four vessels including guided missile cruiser Philippine Sea (CG-58), and guided missile destroyers Roosevelt (DDG-80) and Truxtun. Some of the group’s commands deployed from stations as far apart as Mayport, Fla., and Whidbey Island, Wash.
George H.W. 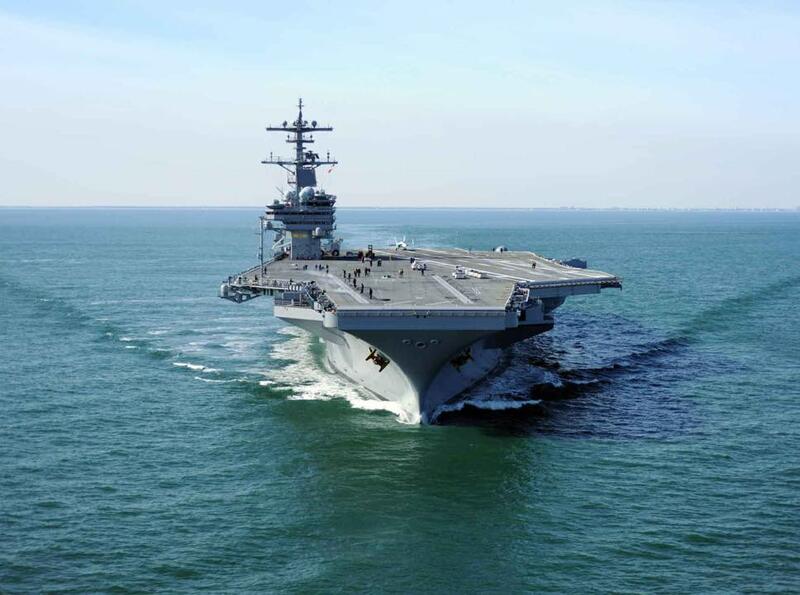 Bush operated in proximity of Russian aircraft cruiser Admiral Kuznetsov in the Eastern Mediterranean, and on 23 March relieved aircraft carrier Harry S. Truman (CVN-76) in the Fifth Fleet, taking part in Operation Enduring Freedom. Massive Islamic State of Iraq and the Levant (ISIL) advances embroiled the region, however, and within one 30-hour period in August, George H.W. Bush launched combat sorties to support the Afghan Democratic run-off elections, and then came about and steamed at her best possible speed on westerly courses, passing through the Strait of Hormuz to fight in two theaters of war within the same day. On 8 August, the ship launched armed close air support and intelligence, reconnaissance, and surveillance missions that supported thousands of American servicemembers and civilians consolidating in Baghdad against the ISIL advance. George H.W. Bush provided the principal coalition strike option during these first crucial days of the allied counterattack. The U.S.-led coalition gradually expanded these battles to contain ISIL, subsequently designating the fighting as Operation Inherent Resolve. In addition, thousands of Iraqis fled the advancing ISIL troops and required immediate humanitarian relief. Two USAF Lockheed Martin F-16 Fighting Falcons therefore escorted a Boeing C-17A Globemaster III and two Lockheed Martin C-130 Hercules’ that dropped food and water to Iraqi refugees near Sinjar, Iraq, overnight on 8 and 9 August. The Globemaster III dropped 40 Container Deliver System bundles of fresh drinking water, and a Hercules supported the drop by adding 16 bundles totaling 5,300 gallons of potable water. The second Hercules dropped 16 bundles totaling 8,000 meals ready to eat. Coalition aircraft continued the humanitarian relief flights during the subsequent nights. Aircraft flying from George H.W. Bush and from five Arab nations participated in the first extensive coalition offensive strikes on 23 September 2014. These aircraft flew deep into Syrian territory against ISIL and the Khorasan Group, an organization of senior al-Qaeda Islamic extremists, destroying multiple enemy training compounds, headquarters and command and control facilities, storage facilities, a finance center, armed vehicles, and supply trucks. Philippine Sea and guided missile destroyer Arleigh Burke (DDG-51), operating in the Northern Arabian Gulf and Red Sea, respectively, also participated in these initial battles, firing a total of 47 BGM-109 Tomahawk Land Attack Missiles (TLAMs). The devastating combination of air and missile strikes slowed the ISIL thrust in northern and central Iraq. George H.W. Bush came about following 54 days of launching strikes. Aircraft flying from the ship made 3,245 combat sorties of 18,333 combat flight hours supporting Enduring Freedom and Inherent Resolve, dropping 232 precision guided bombs and firing more than 2,400 rounds of 20 millimeter ammunition. “This ship and air wing team,” Capt. Andrew J. Loiselle, George H.W. Bush’s commanding officer, afterward reflected, “possesses tremendous capabilities which can, and did, have an immediate impact on events in the U.S. 5th and 6th Fleet areas of operations.” Aircraft carrier Carl Vinson (CVN-70) relieved George H.W. Bush on 18 October 2014, and she passed northbound through the Suez Canal on 27 October and returned to Norfolk on 15 November. The ship returned to the Mediterranean and launched strikes against ISIL military targets on 13 February 2017. “The precision strike operations being carried out by the Bush Carrier Strike Group in the eastern Mediterranean Sea,” Vice Adm. Christopher W. Grady, Commander Sixth Fleet, observed, “continue to demonstrate the tremendous warfighting capability and flexibility of the U.S. Navy. By defeating violent extremists in Iraq and Syria, we are simultaneously supporting two separate geographic combatant commands. We remain committed to defeating Daesh, committed to our allies and partners, and committed to global security.” At times, the carrier operated with Hue City (CG-66) and Philippine Sea, Laboon (DDG-58) and Truxtun, and Danish guided missile frigate Peter Willemoes (F.362). CVW-8 deployed with the F/A-18E Super Hornets of VFAs 31 and 87; F/A-18Fs of VFA-213; F/A-18Cs of VFA-37; E-2C Hawkeyes of VAW-124; EA-18G Growlers of VAQ-131; C-2A Greyhounds of VRC-40; MH-60S Seahawks of HSC-9; and MH-60Rs of HSM-70.